CHILLING ADVENTURES OF SABRINA #1, the latest smash-hit by Harvey award-winning writer Roberto Aguirre-Sacasa and break-out artist Robert Hack, has sold out at Diamond and will be going back to press for a 2nd printing. SABRINA #1 has received widespread attention and praise from mainstream news, horror, and comic sites including THE AV CLUB, USA TODAY, BLOODY DISGUSTING, IGN, BLEEDING COOL, COMIC BOOK RESOURCES, COMICS ALLIANCE, COMICBOOK.COM, THE MARY SUE, and many more. 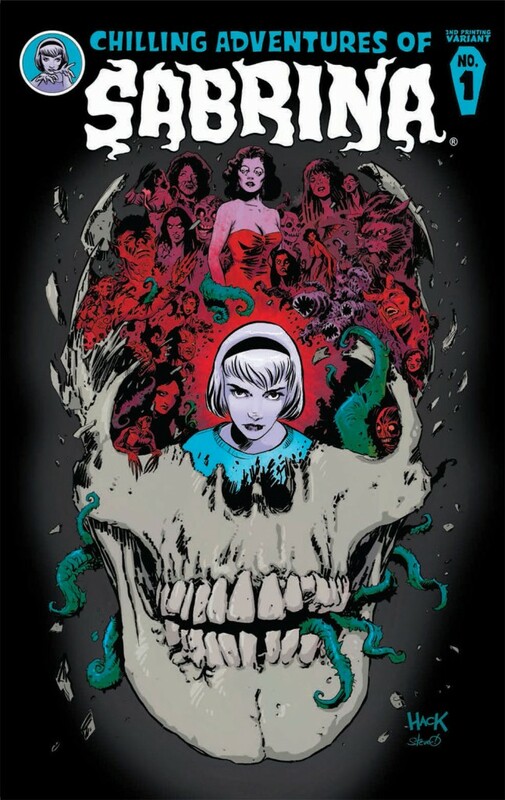 CHILLING ADVENTURES OF SABRINA #1 2nd printing will feature a recolored version of the mind-blowing “reveal” cover by Robert Hack and will be available in November. The definitely not-for-kids adventures of SABRINA continue in CHILLING ADVENTURES OF SABRINA #2 coming in November from Archie Comics. Never miss an issue of your favorite Archie Comic! Get an Archie Comics Subscription and have issues delivered straight to your door! Follow @SabrinaHorror on Twitter and Like us on Facebook to stay up to date on your favorite teenage witch! archie horror, chilling adventures of sabrina, press release, Sabrina. Bookmark.